I need to start with an explanation. This is the first of an occasional series – just a break from the ‘Basix’ series we are currently working our way through, and to which we will return next week. We’re going to tackle some of the ‘hot button’ issues that always come up. In the future we’ll take a look at sexuality, the changes in society, and the relationship between faith and science. But for today, we start with suffering. And I’ve thought and prayed hard about this issue. Like every pastor, it’s been a recurring question over the years. It’s not an academic issue either. Children and babies have died and brought heartbreak. People get cancer, marriages break up, houses get broken into. Suffering is a real issue. And not a day goes by but the TV brings some new atrocity. As I was preparing for this sermon, I read a sermon by the Christian author Lee Strobel. I intend to quote extensively from Lee – because he says the things that I feel it is right to say. So please be aware of this – I’m not passing off what Lee Strobel has said as my words, I’m acknowledging that a whole lot of this he said first. Thank you, Lee. He wrote just after the shooting in 2012 in Aurora, Colorado, when James Holmes killed 12 and injured 70. The first, and perhaps the most important, response, Lee says, is to be honest, and say ‘I don’t know’. There are some general principles – we’ll explore those in a moment or two. But only a fool would attempt to explain a particular tragedy in all its detail. I’m not God, and I don’t have anything like enough understanding of any person’s situation to explain. And let’s be clear – for many people, that ‘I don’t know’ is as far as an explanation can go. If there is no God and no purpose, then asking the question ‘why’ is meaningless. Ask Richard Dawkins why innocent people suffer, and he’ll tell you that there is no meaning, there is no ‘innocent’. The universe doesn’t care, and never will. 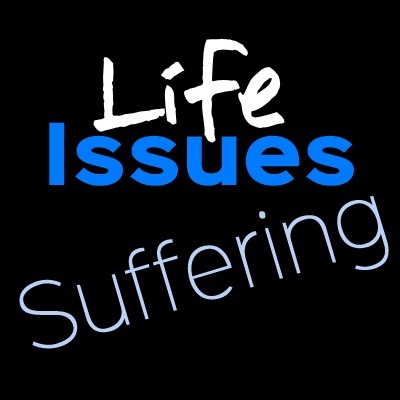 Suffering is an issue for people like us who believe that there is meaning and purpose to existence. If you don’t believe that, then get used to the fact that the answer to the question ‘why suffering’ is ‘there are no reasons’. But if God is not the author of tragedy or evil or death, where did they come from? Well, when God decided to create human beings, he wanted us to experience love. But to give us the ability to love, God had to give us free will to decide whether to love or not to love. Why? Because love always involves a choice. In other words: look at your hand. You can choose to use that hand to hold a gun and shoot someone, or you can use it to feed hungry people. It’s your choice. But it’s unfair to shoot someone and then blame God for the existence of evil and suffering. The second kind of evil is called natural evil. These are things like wildfires, earthquakes, tornadoes and hurricanes that cause suffering for people. In two ways, these are also connected to our choices. We can make ‘natural’ disasters worse by our choices – as we build on flood plains (Bangla Desh) or build badly in earthquake zones. And secondly, the Bible tells us that our world is broken because of our choices. Romans 8:22 says, “We know that the whole creation has been groaning as in the pains of childbirth right up to the present time.” In other words, nature longs for redemption to come and for things to be set right. That’s the source of disorder and chaos. That’s the first point of light: God created us with the potential to choose freely to love; and that means the ability to choose not to. In other words, He offers us the two very things we need when we’re hurting: peace to deal with our present and courage to deal with our future. How? Because of the resurrection. Because it isn’t over. Because he has conquered the world! Through His own suffering, death and resurrection, He has deprived suffering of its ultimate power over you. Suffering doesn’t have the last word anymore. Death doesn’t have the last word anymore. God has the last word!